GLENVIEW, IL--(Marketwire - February 9, 2010) - The Internet has brought about a sea change in buyer/seller relationships and also changed the way that internal marketing and sales departments must work together to reach sales objectives, according to "Creating Better Alignment Between Sales and Marketing," a new White Paper from NM Marketing Communications. "Whether the economy is thriving or stalling, the task of generating sales leads, providing information that moves customers to decisions and closing the sale is an ongoing challenge for B2B marketing organizations," explains Norwin A. Merens, managing director at NM Marketing Communications. While everyone agrees on the importance of the task, there is disagreement in many organizations about the best methods to achieve results. Corporate culture, organizational silos and competing compensation incentives exacerbate the problem, according to the paper. Adding to the challenge is the availability of information and greater pricing transparency on the Internet that has shifted power to the buyer. At the same time, the Internet has created new methods for marketers to have one-to-one dialogue with customers rather than relying on mass marketing methods. The paper provides an overview of how the buyer/seller relationship has changed, and also offers a seven-step process for marketing and sales to achieve success in this new environment. 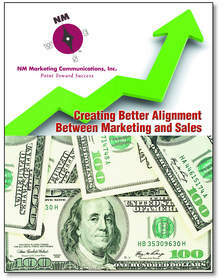 To obtain a copy of the White Paper "Creating Better Alignment Between Sales and Marketing" visit www.nmmarketingbiz.com or contact NM Marketing Communications at 847.657.6011. Established in 1999, NM Marketing Communications is a Chicago-area B2B agency specializing in industrial, professional services, trade association and sports marketing clients. For further information, contact NMMC at 847.657.6011 or at info@nmmarketingbiz.com.